With few exceptions, whenever an actor decides to embark on a music career, that music will inevitably be a sort of wistful, meat-and-potatoes roots rock. It doesn’t take an imaginary degree in pop psychology to understand this. Movie stardom is a fake and fluffy business; the amount of pretense and preening involved can be downright embarrassing at times. So when actors—and this phenomenon predominantly applies to the men—decide they’d rather pick up a guitar and sing for a while, they naturally gravitate to a gritty, unadorned Americana, the kind that captures the salt-of-the-earth, dive-bar lifestyle they’ve forever opted out of. Hence: Russell Crowe’s 30 Odd Foot Of Grunts. Kevin Bacon’s The Bacon Brothers. Kevin Costner’s Kevin Costner & Modern West. Dennis Quaid’s Dennis Quaid And The Sharks. Billy Bob Thornton and Kiefer Sutherland’s, uh, Billy Bob Thornton and Kiefer Sutherland. And so on. For dudes who spend their whole lives being pampered in makeup trailers, the dusty, rootsy side project offers a chance to put on a pair of faded blue jeans and prove that, deep down, you’re just a beer-drinking, Dylan-and-Petty-and-Cash-worshipping regular guy. And look, there’s nothing inherently wrong with that. Sure, maybe it’s just another form of play-acting, but perhaps no more so than the illusion undertaken by your own hometown’s crop of thoroughly average, yet unrealistically ambitious bar bands. The only difference there, of course, is the wildly disproportionate attention that’s afforded them by the media and fans—fans who sometimes even buy their CDs while defensively declaring them “actually pretty good” in their five-star Amazon reviews. Or anyway, they’re not bad. They’ve definitely heard worse. And whereas most people might see some self-indulgent vanity project, well, they know the music is in his heart, and that these raspy, earnest songs are who he really is inside. When it comes down to it, this is the same transactional, illusory emotional connection that’s created by every dude who’s ever picked up an acoustic guitar. It’s just that this particular dude happens to be a millionaire on hiatus between shoots, who can afford top-flight producers and endless studio hours. The other difference is what you’re reading right now, a review of a famous actor’s album that is designed to attract one of two audiences: 1) those aforementioned diehards, who will show up to circle the wagons and lambast the reviewer for talking about everything but the music, then call out his self-evident bitterness, failed dreams, and myriad other reasons for not objectively, critically offering it unreserved praise; and 2) those driven by a semi-morbid curiosity, perhaps looking for a quick hit of schadenfreude and the reassurance that wealthy, famous, attractive people can’t be stars at everything. In some cases, that review may even supplant other actual, in-depth articles on more talented bands whose only real demerit is that they don’t have a TV star in them. The sad, mercenary truth at play is that this is just how it works. It’s the most extreme version of why the pageviews on a music review for someone you’ve already heard of will always be 10 times that of one for a more deserving, yet unknown artist. It’s why the comments for our monthly album previews inevitably have someone sneering, “You just made all these bands up.” It’s why you clicked. It is a mutually beneficial parasitic relationship, and it’s what keeps the celebrity band ecosystem humming. Duchovny did do it again. His sophomore album, Every Third Thought, is another collection of perfectly serviceable famous-dad-rock, once again delivered with the aw-shucks shrug of a guy who clearly had fun making it in between seasons of The X-Files. If you liked Duchovny’s first album—if you thought it was actually pretty good or, anyway, not bad—then chances are you will feel equally okay with this one, an album that firmly stays that middlebrow course. 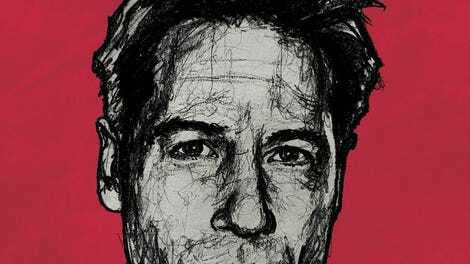 It is once again squarely pitched at the loyal fan base of people who like Duchovny’s face, whatever it happens to be doing, and it’s difficult to imagine it bringing in new listeners outside of that dedicated circle. Not unless you’ve been pining for a slightly less interesting Wilco, preferably featuring the guy from Californication. In that spirit, here’s a review you can also take or leave. Duchovny has billed Every Third Thought as “a real growth lyrically and musically,” and while the latter is debatable—there is certainly more music, in the form of mountains of overdubs—the former is most evident in the way Duchovny, who boasts a masters in English literature, has shoehorned in far more pretentious biblical references and tortured metaphors this time around. “If you come back to me / I’ll slap the cuffs on the hands of time / Or maybe I can’t, but I’ll try,” goes one sort-of couplet (“Maybe I Can’t”). “Like a Roman coin in my pocket / Your love weighs me down from above,” goes the refrain of another. (That one’s called “Roman Coin.”) On lead single “Half Life,” Duchovny calls upon archaeology, the sexiest of the sciences, to muse, “Unconditional love decays / Only fossilized hearts can break / Every piece is indivisible.” It’s the kind of overwrought romantic poetry that’s long called star-crossed lovers back to one another, across oceans of time and the Laurel Canyon, and maybe it’ll make Tim Daly uncomfortable. These are terrible lyrics, and they’re delivered in a flat, hesitant voice that still strains to hold a note over an expensive-sounding, slide guitar-heavy stew of the best studio musicianship DVD royalties can buy. But again, Duchovny’s earnest, affable approach to the whole endeavor makes Every Third Thought difficult to outright mock, let alone hate. Its ambitions are too commendably modest, its doin’-my-thing goals far too relatable. When the album’s most straightforwardly rocking track, “When The Whistle Blows,” fades out over its chunky guitar riff, you can hear a bit of studio chatter that’s broken up by gales of laughter. These are people who are having a good time—regular guys just blowing off some steam, enjoying each other’s company, cooking up some tunes. 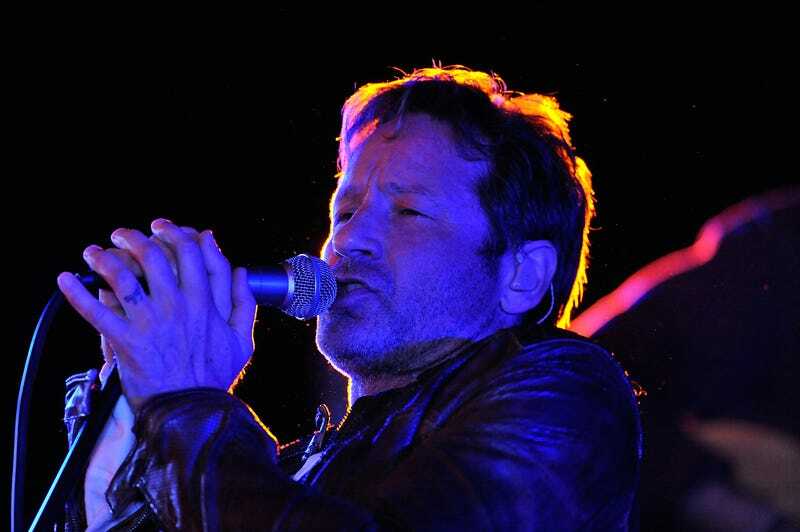 There are certainly worse ways David Duchovny could be spending his off-hours. Also, The X-Files is a really good show. And so, there it sits on the shelf—a record predestined for BuzzFeed listicles of “Celebrities You Never Realized Released Albums” that no one will actually, sincerely spin outside of Duchovny’s staff and most ardent admirers, or whatever model happens to be in his car when it shuffles up on his stereo, Duchovny feigning embarrassment while he sneaks looks to see if she’s digging it. She thinks it’s pretty good, actually! Or anyway, it’s not bad. Most importantly, it’s David Duchovny.